I mentioned briefly in my post about controlling LEDs with my Amazon Echo that I have some wireless outlet switches that I wanted to control. At the time I didn’t have a transmitter that could switch them on, and it didn’t really want to crack open the remote and mess with it. Weeks later, the transmitter that I’d ordered arrived. I didn’t have much opportunity to dive into it in the project until this weekend. First off, there are a lot of people who have already done this. That kind of thing is nice because it means many of the difficult problems have been solved and I can get to doing the cool part. After poking around a bunch of posts and pages about similar projects. I found this instructable that provided a good approach to solving this problem. The first thing to notice about these the 4 bits in the front and the 4 in the back. They’re identical, which means they probably act as some sort of flag for the receiver “beginning” and “end” – so the stuff in the middle is what we really care about. 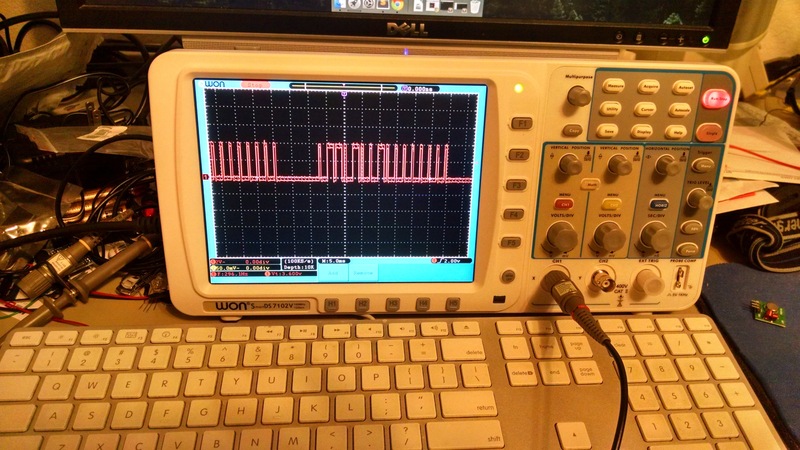 Those 8 bits in the middle are the specific signal for a given channel. The next thing we need to do, is replicate it and the trick to that is going to be timing. We need to know whether something should be read as a “1” or a “0”. The way we do this is count how long the signal was high. 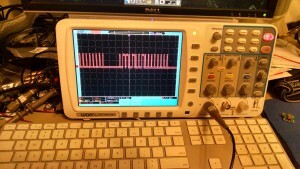 Going back to the oscilloscope, I measured the times when the signal changed, and did the math to figure out the gaps. Turns out my scope has a way to capture the screen. I wasn’t able to find it from the menu, but I was able to access it over the network. Now, the big question is “Did it all work?” Yes! The following video is not awesome because the camera on my phone doesn’t like quick changes in light, but it does show how this all works. In this particular code I have the lights switching on an off. Because of some timer issues I haven’t resolved they don’t quite turn on and off simultaneously. It was a fun little project. 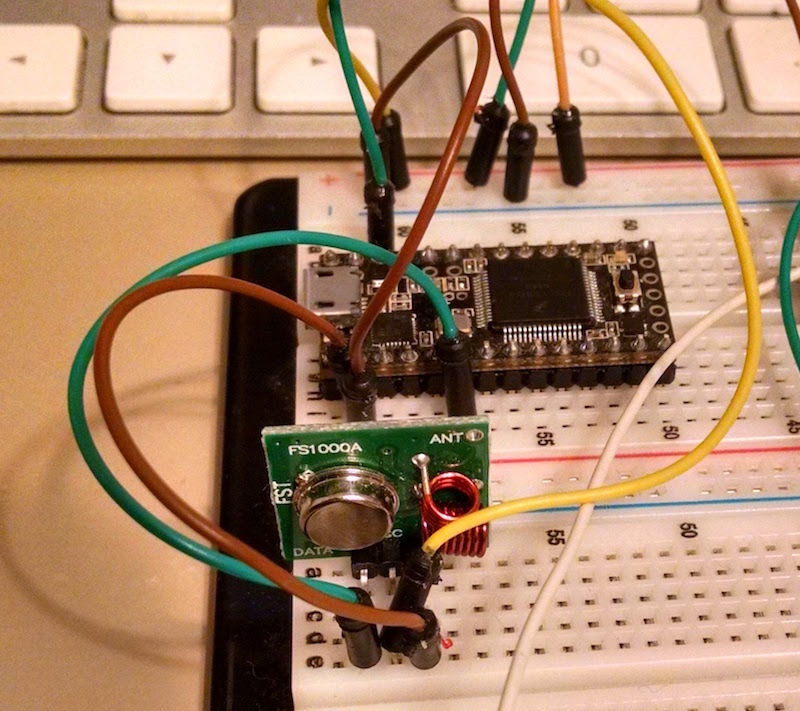 The next thing I hope to do with this is pull it out of the Teensy circuit and connect it to an ESP8266 – a wifi chip. That way I can control it directly over the network, it can even serve its own web page! This is just too cool. 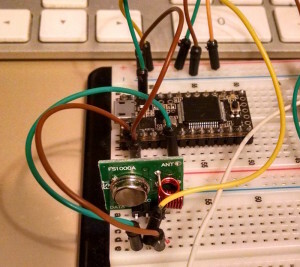 I’ve been trying to make a O-Scope from an Arduino. I’m looking at doing this with the remote for my fan in my room. I think it uses the same RF. More stuff for Alexa to run.